Food For thought Friday: Burn, Baby, Burn! You started out as a means to an end, but became so much more. You were supposed to be my debt consolidation ticket to the good life, instead, like an idiot, I was seduced into making you my constant companion. You’ve followed me (stalked me) from Tuscaloosa, Ala., to Sarasota, Fla., to Anniston, Ala., Montgomery, Ala., and to Alexandria, Va. dragging me down to a point where I never thought I would be free, but today I am free. Like a demon, temporarily cast out, you came back not only stronger but with equally strong friends. But today, we’re breaking up. And this time it’s for good. I can’t say I’m sorry to see you go because it really is you. It’s no longer me. Categories: Operation Do Better, Uncategorized | Tags: and we saved, debt relief, debt snowball, operation do better | Permalink. Loves IT!!! 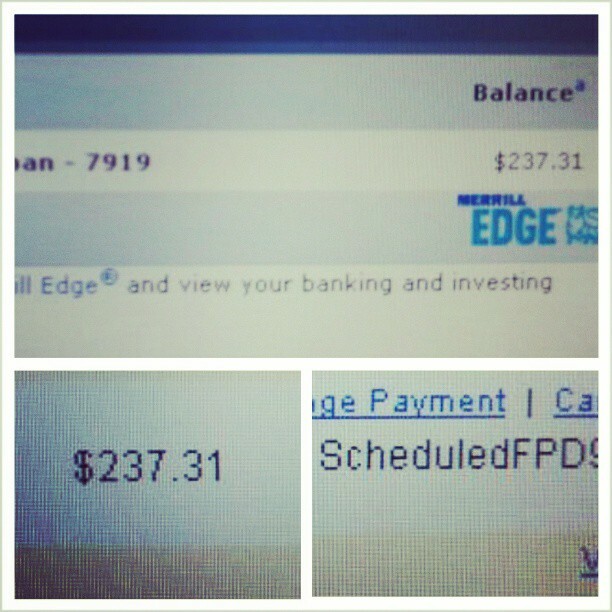 I just made the LAST PAYMENT in a BILL YESTERDAY as well!!! Kiss my grass baby!!! !